Welcome back to Get Empowered! My tip-of-the-week blog for Empower Software kicks off by taking a closer look at the Empower QuickStart Interface. There is so much to cover in this series, so I have broken it up in to three tips. The Empower QuickStart Interface is great for new or infrequent users of Empower Chromatography Data Software (CDS). 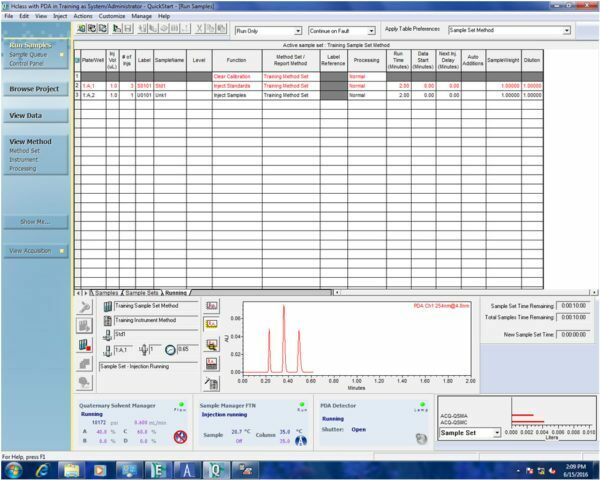 When you login to Empower, you select a project to work in and a chromatographic system (HPLC or GC) to use for data acquisition (Figure 1). The interface opens and we see the navigation bar on the left, which will guide us through the software (Figure 2). When you make a selection in the navigation bar, the work area, tools, and menus will change accordingly. Run Samples and the Sample Queue are highlighted in the navigation bar by default. This is the data acquisition area of the software and it is here that you can queue up and run samples (Figure 3). If you click Browse Project in the navigation bar you can see the contents of the project, which is divided up into tabs, such as samples sets, results, and methods (Figure 4). Empower Software’s View Data button functions in two ways. If you highlight a channel of raw data and click View Data, it brings you to the Review Data Main Window where you can view the un-integrated chromatogram (Figure 5). On the other hand, if you highlight a result and click View Data it brings you to the Preview Data window, where you can preview the result with a report method (Figure 6). If we look at the View Method section of the navigation bar and click, for example, Instrument – Empower reads the configuration of your chromatographic system and displays icons for the components of the system. You can then set the instrument control and data acquisition parameters for your system, which are then saved in an Instrument Method (Figure 7). The last selection is View Acquisition. This allows you to toggle the live acquisition screen on and off if you are collecting data while performing other tasks in Empower (Figure 8). I am going to stop here. I hope this provided a basic overview to get you started and get using Empower QuickStart interface for HPLC, UHPLC, GC, or UPLC. In the next blog (Tip#2) I will discuss Empower Interactive help (“Show me”).